What’s the one thing you can’t live without? This question was asked of me not long ago. I know I’m supposed to say a toothbrush or something like that, but I gave it a lot of thought, and the answer became very clear to me, salvation. Because without salvation there would be no hope, and without hope, there would be no future of an afterlife in heaven. How can we receive salvation and the hope for a future that comes with it? 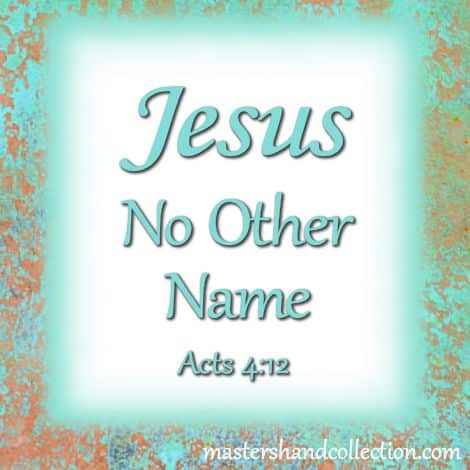 Acts 4:12 makes it very clear that salvation comes from no other name than Jesus. Jesus is the door that we must enter through if we want to receive the free gift of God’s grace and it is only through the blood of Jesus that we are saved. Jesus, Himself, said “I am the way, the truth, and the life. No one comes to the Father except through Me” John 14:6. If we want to get to heaven, faith in Jesus is the one and only way to get there. But salvation is so much deeper than just getting to heaven. It is the beginning of an ongoing and lasting relationship with the one true Savior of the world, Jesus. Because of this relationship, we can turn to Jesus in any circumstance. When life gets difficult, He is our refuge against the storm, protecting us from the wind and rain. When life is going well, He is our champion, cheering us on toward the goal He has set for us. Jesus is always there. He is always faithful. Even when we are not. I’m not perfect. I make mistakes and I don’t always do everything right. That’s why I need a Savior. Even though I don’t deserve it, God sent His Son to save me. Because of my faith in His Son, God has given me His grace and forgiveness of sins. He has made a way for me to spend eternity with Him. He did it because of His great love for me. I’m so grateful for all that God has done. And I’m so thankful for a loving Savior who wants to have a real and meaningful relationship with me. 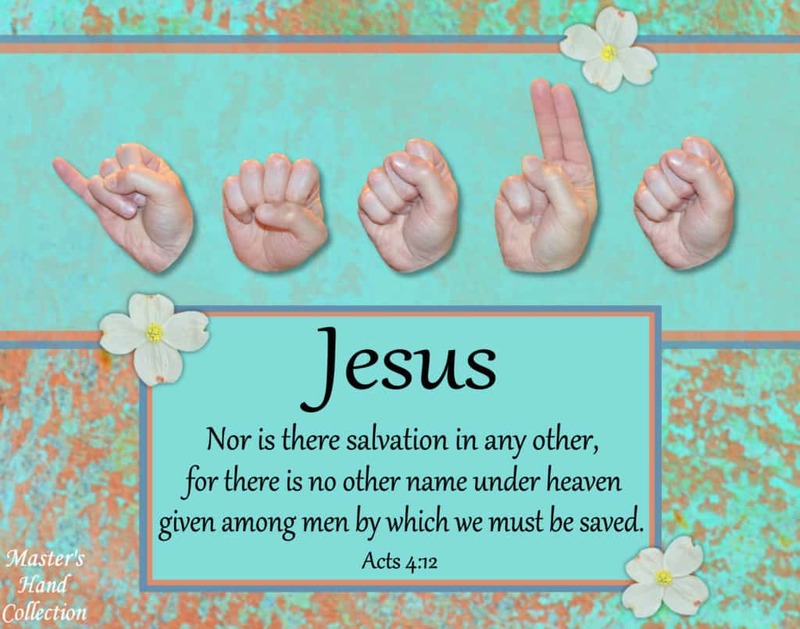 Salvation comes from no other name than Jesus. And it is definitely the one thing I can’t live without. 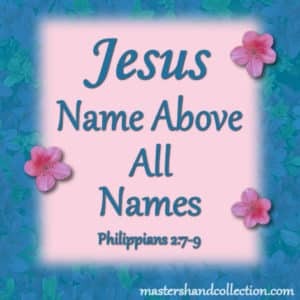 For those of you who are already saved, today I pray that you will be encouraged and comforted by the name of Jesus! For those of you who don’t know Jesus as your Savior, I pray that you will see the love that Jesus has for you. And I pray that you will find the hope in Him that is waiting for you. To find out what it means to be “saved” and about how Accepting Jesus as your Savior will change your life, click on the Accepting Jesus tab at the top of this page. Connie, your art work intrigues me. Are you a deaf interpreter? I came up with another answer to your question. But by the end you had me convinced that Salvation is was better than my answer. Thank you for your encouraging words. I’m not a deaf interpreter but I grew up in a church that had a deaf ministry and my childhood best friend had parents who were deaf. Sign Language has always fascinated me. 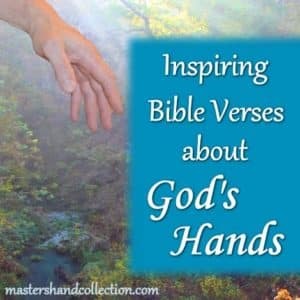 My goal in creating this artwork is to share with other Christians how important it is to share the gospel with the deaf community. They are a very overlooked group of people and they need Jesus too. Thanks again and God bless! P.S. What was your answer? What is it that you can’t live without? Thank you for sharing the gift of salvation – and the plan to receive it. I need to do that much more with my blogging! Praising the Lord for my salvation!! Hi Jennifer! Yes, praise the Lord, we are saved! God bless!